Is There Evidence The Walls Of Jericho Came Tumbling Down? Is there actual physical evidence that the walls of Jericho came crashing down? Joshua had taken Israel across the Jordan and into the Promised Land, but next he was to rid the nations who were living there, primarily because of their pagan religions and rituals, some of which could infect the Israelites worship of God and if they allowed pagan daughters to intermarry among the Jewish men, then the decline of Israel would soon begin. God had chosen Israel to be a light or an example to the world and He knew they must remain loyal to the laws of God, so by Joshua taking Jericho by force, He was only obeying what God had commanded him and Israel to do. Joshua trusted God and knew that He always knew what was in the best interests of the nation, even if he didn’t always understand God’s ways. After 7 days of marching around Jericho, “the people shouted, and the trumpets were blown. As soon as the people heard the sound of the trumpet, the people shouted a great shout, and the wall fell down flat, so that the people went up into the city, every man straight before him, and they captured the city” (Joshua 6:20). The question that always seems to come to us is, “Was it the shouting and the trumpets that destabilized the walls of Jericho so that they’d come tumbling down,” or, was it simply “God doing what He had already predetermined to do?” Certainly the latter, but God may have used them as a means to His end. Also, let’s think about the Israelites for a moment. What they were doing must have made no sense at all to them. It might have even puzzled the citizens of Jericho, however, as is often the case, obedience comes before understanding. They did what they were told to do and God promised to do what He said He would do (as always). The wall fell down flat, either because of the shouts and trumpets or because God brought them down. As I said, He could have used the nation as a means to His end, but either way, without God, this was not going to happen because the walls of Jericho were nearly impregnable, and Israel didn’t have the technology at the time to take the city-state without a long, drawn out siege. Ultimately of course, it took God or it would have never happened. I think that’s the lesson; trust God and give Him all the glory. The walls of Jericho were of such strength that the nation of Israel could not possibly have taken it without a years-long siege and surrounding them to prevent resupplying their food because they already had a source of water. For one thing, the walls were thick and wide enough to provide the space for apartments and dwellings. Rahab the prostitute allowed the spies to enter her home (Joshua 6:17), and she had enough space to be able to hide them if the kings guards came searching for them. Jericho was built on a hill or mound and there was about a 22 degree angle that had a wall that was 12 to 15 feet tall and was several feet thick. The ground continues to slope upward and then there is another wall, but this one was 20 to 26 feet high and 6 feet thick. Finally, there was a 46 foot wall that made a space wide enough to have residents living inside of it and was part of their fortification. This confirms the fact that it would take God’s direct intervention to take Jericho down. In circling Jericho for 7 days, the Israelites might have thought, “How are we ever going to destroy such a fortress?” Perhaps a clue to attributing this to God is the fact Israel did not have it within their means to overtake Jericho. There is also the fact that only Rahab’s home was left and it was because of a promise they had made to Rahab that she and her household could escape the coming destruction of Jericho (Joshua 6:22-23). There is evidence that a small section of the wall didn’t fully collapse. This could have been where Rahab’s home was located. It would seem to fit the biblical text. There’ll be more on this later. The New Testament’s so-called “Hall of Faith” mentions the walls of Jericho. The author of Hebrews writes, “By faith the walls of Jericho fell down after they had been encircled for seven days” (Heb 11:30), and it was “By faith Rahab the prostitute did not perish with those who were disobedient, because she had given a friendly welcome to the spies” (Heb 11:31). That might be another lesson about Jericho. It is by faith and not by strength that the walls came down. Whether, as some believe, it was by the marching or horns and shouting that brought them down, they forget that it was impossible to take Jericho without God. In Greek the author of Hebrews uses for “fell” (“piptō”), as in the walls “fell down,” suggests something that is “thrown down” and as a metaphor for “to fall under judgment.” In Joshua’s account, the word for “fell down flat” (Joshua 6:20) is the Hebrew word “tachath” from which we get “flat” and means “the under part” or “beneath,” and evidence of just that happening has been unearthed on more than one occasion at the ruins of Jericho, so both the Hebrew and the Greek suggest the wall “fell beneath itself” or, it collapsed from within or from below. In other words, the foundation fell and the wall followed. 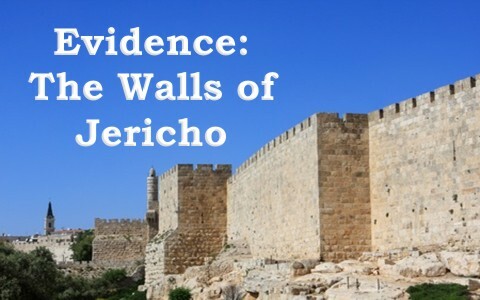 There is real evidence that Jericho was also burned with fire as they were told to do by God (Jer 6:24), and there is even a section of the wall that did not totally collapse, perhaps showing the place where Rahab and her household lived, so I can easily give you dozens of accounts where they have discovered the walls of Jericho and the fact that they fell down, just as described in the Bible, but what the physical evidence cannot tell you or anyone else is that you now must believe in God. No one can be talked into believing in Jesus Christ. Not even a bunch of archaeologists, who can show you enough physical evidence that the Bible is true, can do that. Neither can anyone show that Jesus is the Son of God Who came to give His life as a ransom for many (Mark 10:45). I could line up one archaeologist (and theologian) after another, but they couldn’t convince you. It must be the Spirit of God Who reveals the Son of God, but only for those who are called by God (John 6:44). It is not a matter of me convincing you; it is the inner Word (the Holy Spirit) opening the outer Word (the Bible) to see the Living Word, Jesus Christ. Previous post: What Does It Mean to Work Out Your Own Salvation? Next post: Why Did God Tell Moses He Would Kill Him?